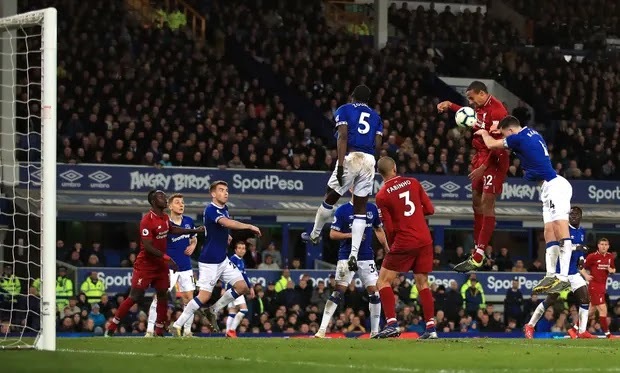 Everton put a huge dent in Liverpool's title challenge as they held their rivals to a draw, while Higuain and Jorginho were on target as Chelsea hand Scott Parker a losing start as Fulham caretaker boss. The 200th Merseyside derby in the league ended in a 0-0 draw, as Everton held Liverpool at Goodison Park on Sunday. Liverpool had the better chances throughout as Jordan Pickford denied Mohamed Salah, with Marco Silva‘s Everton putting in a battling display to grab a point. With the draw Liverpool remain in second place in the English Premier League table and Jurgen Klopp‘s side are now one point behind leaders Man City, while Everton are in 10th on 37 points. Chelsea edged past battling Fulham 2-1 at Craven Cottage on Sunday, as Maurizio Sarri‘s men remain in the top four hunt. Gonzalo Higuain and Jorginho put Chelsea ahead twice in the first half as Calum Chambers had briefly put Fulham level. The Cottagers, coached by interim boss Scott Parker who replaced Claudio Ranieri on Thursday, battled until the end and almost snatched a draw on several occasions late on but Kepa Arrizabalaga made some great stops. With the win Chelsea move on to 56 points and are two points off the top four with a game in hand. Fulham remain in 19th place and are 10 points from safety with nine games to go. Watford beat Leicester City 2-1 at Vicarage Road, as Brendan Rodgers‘ first game in charge of the Foxes ended in bitter disappointment. A stoppage time winner from substitute Andre Gray saw Watford grab all three points, as Javi Gracia‘s men took the lead through Troy Deeney early on and dominated vast swathes of the game. Jamie Vardy equalised 15 minutes from time and it looked like Leicester would grab a point, but Gray delivered in the 92nd minute as Rodgers’ return to the EPL wasn’t a happy one. With the win Watford move level with seventh-place Wolves on 43 points, while Leicester remain in 11th on 35 points. Serie A side Udinese have confirmed that they have signed Stefano Okaka from Watford on loan. Paris Saint-Germain coach Thomas Tuchel has branded Manchester United the 'Guingamp of the English Premier League'.